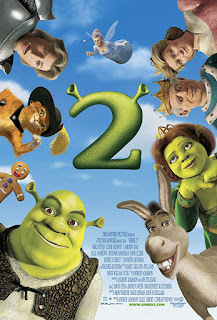 On this week's episode, the gang is heading back to Far Far Away to chat about the dreadful, award-winning sequel, Shrek 2! What's with all the extraordinarily large bosoms in this movie? Why does Puss in Boots immediately start calling Shrek "boss"? And what were they thinking with all these donkey/dragon mashup babies? PLUS: Mario Mario loses out on Yankees tickets! Shrek 2 stars Mike Myers, Eddie Murphy, Cameron Diaz, Julie Andrews, John Cleese, Antonio Banderas, Rupert Everett, and Jennifer Saunders; directed by Andrew Adamson, Kelly Asbury & Conrad Vernon.